Whistler is Canada’s largest ski resort. It is easily accessible from Vancouver; a straightforward two hour drive, along the Sea to Sky Highway. The resort offers a world-class winter snow holiday in a sophisticated and friendly Canadian atmosphere. Whistler is consistently ranked as one of the best ski resorts in the world – a point proven, as the chosen host to the 2010 Olympic and Paralympic Winter Games. The resort exudes an energy and vibe. Skiers, boarders, outdoor enthusiasts, and snow-adventurers flock here, from around the globe. It’s your turn to enjoy everything this resort has on offer. The choice of mountains, villages, terrain, infrastructure, and amenities is expansive. This next statement is big. This epic resort can proudly boast to have the most choice of any service, or activity, you can imagine you will need, compared to any other Canadian ski destination. Whether it’s your first time, or repeat visit, this resort ticks all the boxes. In summary, this year-round world-class destination, is a place for families to come together; couples to immerse themselves. Après is both an art-form and an open invitation. Sophisticated tastes can be satisfied as equally as the needs of families looking for a casual retreat. Because this resort can be all things to all people, it really is one of our favourites. Two side-by-side mountains, Whistler and Blackcomb, are linked by the extraordinary award-winning PEAK 2 PEAK Gondola. Riders can experience the world’s longest unsupported span for a lift of this kind. Located in the Coast Mountains of British Columbia, Whistler enjoys an immense snowfall each year. It enjoys one of the longest seasons in North America. We have to be honest. Whistler snow can break all records, with powder dumps that you can only dream about. The statistics tell the story − with an annual average 38.5 feet or 11.74 metres of snow. That is a serious amount of accumulation. However, being coastal, sometimes the snow may be heavier than you’ll find at some of the interior resorts of British Columbia, Canada, or Colorado, USA. Occasionally you may encounter rain in the villages, but bucketing snow up top. Whistler aficionados swear by this mega-resort, and take the variable snow and weather conditions in their stride, and we recommend you do too. Probably this is one resort that should be on everyone’s bucket list. This is a mega-ski resort, a destination mecca for everyone and anyone. Let’s break it down into the two mountains and three villages. You can then determine which area is best for you, your family and your travel buddies. Whistler Village – Skiers Plaza at night. Is where you will find: all the action, the majority of restaurants, retail, and other resort services. It is a bustling pedestrian village, cleverly designed with an outer vehicle ring road, serviced by a regular free shuttle buses. Conveniently located at the base of Whistler Mountain, there is an enormous choice of accommodation to suit all budgets and levels of luxury. There is a selection of ski-in, ski-out condominiums and luxury hotels right at the gondola. The majority of accommodations are accessed via the pedestrian village and free loop shuttle bus. In summary, Whistler Village is the centre the entire resort: for retail, restaurant, and other services. Everything from five star dining, designer brand boutiques, to the necessary equipment rentals, supermarkets, banks, art gallery and community library, can be found in the village. It takes approximately 15 minutes to walk (in ski boots) from the Whistler Village Gondola to the perimeter of Whistler Village. Plenty of dining and après ski at Blackcomb. Blackcomb Village, by comparison, has a much smaller retail hub, yet an equally massive mountain of terrain, making it a real favourite for skiers and boarders. This village is squarely aimed at families and a quieter atmosphere for visitors. The real advantage, is the diverse offering of ski-in, ski-out accommodation. Choose from self-contained family-friendly and larger condominiums across all budgets; along with some of Whistler’s most luxurious hotels. Another plus for families is a more laid-back village square, and home of the world-renowned and easily accessible Blackcomb Kids Ski School. This village is a short 5-10 minute walk, or 3-5 minute free shuttle bus ride, from Whistler Village. Fresh snow in Creekside, perfect ski-in, ski-out location with gondola access at your doorstep. Another option is Creekside, the original base of Whistler Mountain. It is an excellent option for families, because it is much smaller and more intimate, yet still offers an extensive array of accommodation options. The ‘Creek’ is an easy-going, family friendly village situated just 7 kilometres south of Whistler Village. Best of all, guests opting to stay at Creekside enjoy the best of both worlds – quick access via the Creekside gondola steps from your condo door, which provides high speed access to the mid-mountain Kids Ski School; and yet a quieter more intimate village lifestyle. Creekside is a 10 –15 minute free bus ride from the centre of Whistler. 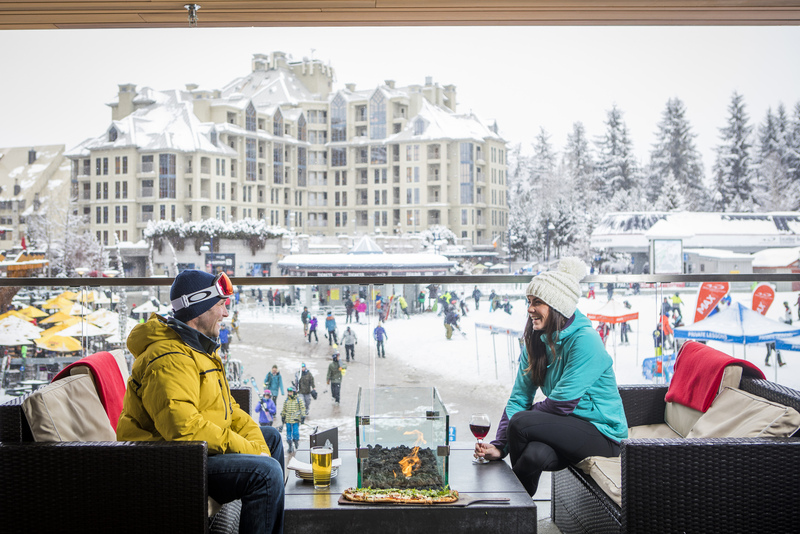 In summary, if you are looking for après ski, stick with Whistler Village. If a quieter pace is important, yet still with easy access to the slopes, and you want to be just a stone’s throw from all the action, our choice is Blackcomb. For those looking for a more intimate ‘smaller feel’, and ski-in, ski-out village, Creekside is the best choice. Each village offers a range of accommodation standards, amenities and facilities. Book Now! There is a huge variety of accommodation to suit all budgets and requirements at Whistler, Blackcomb and Creekside. Choose from international six-star hotels, condominiums, chalets to budget backpacker hostels. To ensure you choose the accommodation that’s the best fit for you, it helps to understand the mountain layout. Download the Whistler map. #1. The most terrain in North America, not just Canada. This is a mega-resort, and yet all areas are easily linked and very accessible. Whistler is big, boasting some 8,171 acres (3,307 hectares) to play in, including sixteen powder-filled alpine bowls, three glaciers, and more than two hundred trails. #2. Whistler is a winter adventure destination for everyone, with an endless array of on-snow adventures. 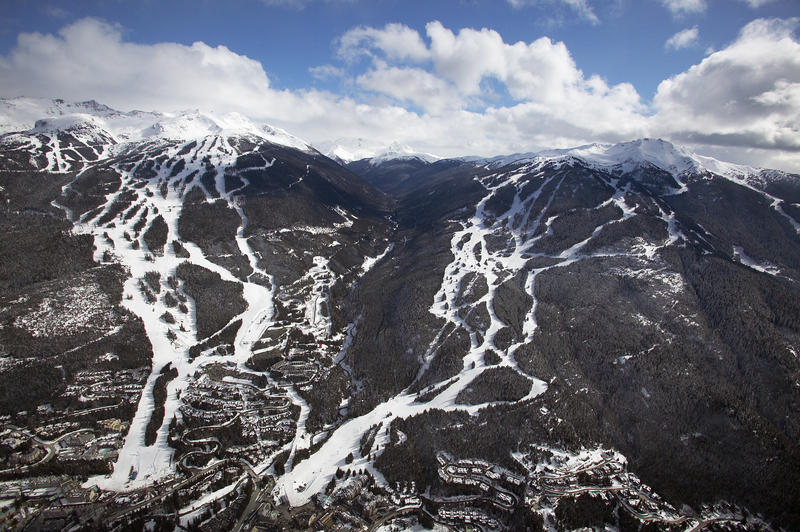 A huge choice of terrain, linked by the PEAK 2 PEAK Gondola for inbound skiing and riding, plus access to glacier, back-country, and heli-skiing. #3. Après ski scene – the best and most diverse in Canada; with more than 90 restaurants, bars, and cafes. From quirky late night bars, five star culinary experiences, to a burger joint, or vegetarian bistro, and everything between. Whistler is a mecca for food and wine lovers. Whether you’re looking for intense or intimate, hard-driving or soul-soothing, an escape or an indulgence, Whistler has it all. #4. Altitude and climate –The mountains are some the highest in North America, yet the village altitude is 2,214 ft (675 m) above sea level, so there is no time lost to acclimatize. The coastal climate provides for milder temperatures, rarely dipping below -10°C (12°F). This is a real plus for families with children. #5. There’s more to Whistler than majestic mountains, skiing and snowboarding. Enjoy a non-stop line up of festivals and events. Whistler boasts a rich cultural landscape – encompassing arts, first nation’s history, film festivals, the culinary Cornucopia festival, Whistler Gay Pride Week, and more. SNOW HOW TIP: Download the Whistler and Blackcomb Mountain map for kids including family friendly zones, places to warm up, ear and designated play areas. Whistler is heavenly for Nordic sports enthusiasts where untouched mountain wilderness meets Olympic-level trails. Multiple Olympic standard venues at Lost Lake Park and Callaghan Valley offer cross-country skiing, night skiing, biathlon, dog-friendly trails. Enjoy the 99 miles (160 km) of trails, available for all ability levels. Learn more. Only a short walk from Whistler Village, this venue offers over 19.8 miles (32 km) of cross country trails plus snowshoeing,and night skiing. Learn more. Purpose built for the Vancouver 2010 Olympic and Paralympic Winter Games, the centre offers Nordic skiing, tobogganing, snowshoeing, biathlon, and base boarding. Rent equipment on site and take a lesson in classic or skate skiing at a world class facility. Learn more. Immerse yourself in the charm and warmth of traditional ski centre culture, based at a backcountry lodge; and enjoy the great outdoors whilst you XC ski, snowshoe. Try a new experience: ski touring, fat tyre biking, or simply exercise the dog and at the end of it all cozy up to the trailside bonfire. On-site services include equipment rentals, tours, all-inclusive packages, and snowcat shuttle. Learn more. WINTER HOURS OF OPERATION: 9.00 am – 3.30 pm Note: These times are provided by the ski resort and can vary based on external conditions, day of the week, school, and public holidays. Learn to fly, jib, and slide in Whistler Blackcomb’s expertly designed and maintained terrain parks. Choose between five parks over 99 acres (40 ha) with more than 150 features and 40 jumps; a Superpipe, and a Snow Cross track. Varying sizes of challenge allow for entry level riders to gain skill and progress to expert levels. SNOW HOW TIP: Thirteen dedicated groomers care for the parks; 24,000 + hours are spent each season grooming the terrain parks and each park will be groomed twice every 24 hours. Proudly boasts three terrain parks, a halfpipe and permanent snowcross track. Blackcomb Terrain Park puts up 3,480 ft in length and is jam-packed with intermediate and advanced features. The Big Easy Terrain Garden is the perfect playground for beginners with smaller rails and rollers, looking to get some air, yet stay close to the ground. To complete the trio is The Highest Level Park, with mega jumps, rails and jibes of Olympic training standard. Add to this playground, a Halfpipe with a vertical rise of about 1,020 ft (310 m) from top to bottom, and a permanent Snow Cross Course. Note:Helmets are mandatory in this zone. The School Yard, is the coolest school hangout we know. It is a great place for kids to ski and ride and learn the skills necessary for terrain park riding. Continuing the family friendly theme at Whistler, this is a Family Certified zone in the Learning Area on Whistler Mountain. And to complete the variety, Whistler Mountain is home to the Habitat Terrain Park, which offers both beginner to intermediate section (S-M) and an intermediate to advanced section (M-L). The terrain park crew groom both parks with snow jump features, and nature inspired tree jibs, rails and more. Whistler is 121 km (75 mi) from downtown Vancouver, British Columbia – the closest major city. Vancouver is a major international airline hub. There are many airport shuttle companies that offer door-to-door transfers. Click on the map to expand. Transportation to and from Vancouver airport is simple and affordable via: ground shuttles, taxis, limousines, local buses, or even helicopter. DRIVE: Aptly named the “Sea to Sky Highway” – Highway 99 links Vancouver to Whistler via some of the most spectacular coastal wilderness in the world. The highway hugs Canada’s western coastline – Howe Sound, the southern-most fjord in North America, and serves up stunning views of the dramatic glaciers of the Coast Mountains. For safety in winter conditions, passenger vehicles are required to have winter tyres installed to drive the Sea to Sky Highway between October and March. Winter tyres can be requested for rental cars also. SNOW HOW TIP: Enterprise Car Rental are our preferred car rental company, purely based on positive past experiences, and offering a fleet of vehicles with winter tyres. Look for the snowflake symbol on the tyre. Road conditions, closures, travel advisories and more. First up, you don’t need a vehicle. Getting around the resort is easy. The Village is based around the pedestrian-only Village Stroll which allows easy walking access between shops, restaurants, ski lifts and accommodation. When you want to explore further afield, use the Valley Trail or the transit services to get where you want to go. TAXI: Uber is not currently available in Vancouver or Whistler. Whistler Taxi and Resort Cabs operate 24/7. SNOW HOW TIP: Some hotels provide free transportation to/from the airport, please check with your hotel. Both Whistler and Blackcomb mountains have their own dedicated Snow School, offering a diverse and interesting variety of lesson packages. Choose from private, semi-private, and group lessons; a multi-day camp or clinic to hone your skills, and focus on areas you want to develop – steeps, bumps, or powder. The Snow School, has multi-lingual, and specialist adaptive-trained instructors available upon request. The terrain is ideally suited for all lesson types, giving the instructors great flexibility to take group and private lessons to the right runs to suit your comfort and skill level. SNOW HOW TIP: Making advance reservations during Holiday periods is a must to guarantee your preferred lesson type/time. SNOW HOW TIP: Check your ability level to help you enroll in the right Whistler Blackcomb Snow School program to make the most out of your lessons. MAX4 Group Lessons Less is More – having just a maximum of 4 people in a group lesson creates the perfect environment to build your confidence while you learn & discover our incredible mountains. Available in full day and half day afternoon options at both Whistler and Blackcomb. The Camp This is a multi-day ultimate ski experience; open to intermediate skiers able to ski with poles in parallel turns on blue terrain to expert skiers wanting to take their skiing to the next level. Each Camp starts only on Mondays, offering 3-4 days of coaching. Instructors are committed to seeing results in your skiing whether on groomers, bumps, in the gates, deep in powder or the steeps – they will not rest until your skills have improved! Extremely Canadian Steep Ski Clinics The name says it all. A two day Steeps clinic, with an intense focus of skiing steeps techniques. Spend one day at Whistler, one day at Blackcomb. These clinics are geared to advanced-intermediate to expert skiers. With an average ratio of 4 skiers per coach. As a fitting conclusion, Merlin’s Bar and Grill “decompression sessions” will provide you with the perfect stage to tell your best super hero ski stories. Not for the faint-hearted. Women’s Ski or Snowboard Weekend Camps Two days with top female coaching, in a safe and motivating environment. Join like-minded women keen to master confidence at any level of skiing or snowboarding. Extremely Canadian Back Country Adventures A full day of mind-blowing guided backcountry snowboarding, telemarking or skiing, Association of Canadian Mountain Guides (ACMG) will share techniques and tactics to hone your skiing, boost your safety knowledge, and heighten your awareness in big mountain terrain. Minimum Intermediate skier level. Momentum Moguls Clinics The clinics are geared for advanced recreational to competitive skiers of all ages. Unlock the simple mystery of skiing bumps and become an all-round more versatile skier. Must be an advanced skier on the flats, able to do short radius parallel turns. Whistler offers the largest choice of Kid Friendly programs anywhere in Canada. The Magic Castle on Blackcomb and Tree Fort on Whistler are great for families of little ones to check out while exploring the mountains. The Snow School incorporates these magical and fun outdoor adventure playgrounds in their learning programs. Adventure Camps for Kids 3-4 year olds and 5-12 year olds The go to group lesson program for kids. It’s all about having a great time; the camp is jam packed with fun events, themes and activities. Your kids will quickly be at ease, as they have the same instructor allocated all week, allowing enhanced learning progression, measurable results and lasting friendships. Whistler ski and snowboard rentals offer the latest gear and take the hassle out of having to travel with your own gear. Moreover, you’ll be skiing or riding on freshly tuned equipment. By renting your gear, you also have the flexibility to change it up every day, or even during one day. Choose the ski or snowboard that is right for each day depending on conditions: powder, carving, or all-mountain. With six locations in Whistler Village, six locations at Blackcomb Upper Village, and one location at Creekside; convenience is the theme of your ski and snowboard rental gear. Their free overnight ski storage adds even more value. Organizing your rental gear is convenient and easy. Pick-up your equipment after 4 pm the day before your first rental day and avoid the morning rush. Most locations are open till 9.00pm daily. Equipment is top of the line, and you can swap your gear anytime you like at any location. Choose from beginner, standard, and premium/demo packages for skiers and snowboarders, from Burton, Rossignol, K2, Salomon, Atomic, and Head. Whistler can help children aged 3 years and over to be outfitted with ski and snowboard gear to get them up and about on the mountains. SNOW HOW TIP: Whistler’s White Glove rental service can provide any of the rental products offered by Whistler Blackcomb. Delivered direct to your accommodation, along with lift passes, retail items, and anything else you may need. Whistler is a shopper’s delight, and a destination in itself for those not involved in on-mountain sports. The pedestrian village stroll around Whistler Village creates the ideal atmosphere for window and serious shoppers alike. Spend days browsing the neighborhoods for fine artwork and fashion, jewelry, the latest outdoor sports wear and equipment and luxury items – or simply drop in for essential groceries and gifts. Enjoying Whistler is not only about mountain adventures, stunning scenery, and exhilarating skiing and snowboarding. This award winning resort is renowned for its huge array of culinary delights. Whistler’s culinary festival for all things food, Cornucopia, is held every November, and celebrates the best of food and drink from Whistler, British Columbia and beyond. Whistler ticks all the boxes – everything from Cow’s ice creamery, to family friendly Italian trattorias, to five star dining at restaurants of the calibre of Araxi and The Wildflower. What we really love, is the emphasis on the local ‘paddock to plate’ philosophy – chefs are serving up sensational fresh, local cuisine, and in unique locations. Make sure you allow time to explore the culinary delights Whistler has to offer. As the sun sets on Whistler, the après ski season comes alive. Ski right up to slope side bars and enjoy live music to get you dancing in your ski boots. Try something a little different – Wine and Dine at 6000 feet. Once a month during the winter season, perched high on Whistler Mountain, enjoy the stunning views from Steeps Grill & Wine Bar; whilst you savour world class wines paired with locally-sourced culinary delights. For the “Foodies”, Whistler Tasting Tours takes you on a journey through Whistler Village to visit some of the resort’s most fabulous restaurants – all in one night. Each delicious course of the dinner happens at a different venue. Explore the best fine dining or discover the local favourite hidden gems. SNOW HOW TIP: The Finer Things Dinner Tour is the most popular “Foodies” Tasting Tour, featuring 4 delicious courses at four award winning Whistler restaurants and a visit to an impressive 15,000-bottle wine cellar where guests learn to ‘sabre’ champagne. Backcountry Tours Whistler is your gateway to a vast area of unmarked and unpatrolled backcountry access. Peak 2 Peak Gondola Travel the longest and highest lift in the world that links Whistler and Blackcomb mountains. Fresh Tracks & Mountain Breakfast Upload Whistler Village Gondola between 7:15am and 8:00am for a mountain sized breakfast buffet at the Roundhouse Lodge, then enjoy fresh powder or perfectly groomed corduroy all to yourself. Fondue Snowcat Dinner An exclusive dining experience journey to the quaint and charming Crystal Hut, perched atop Blackcomb Mountain at 6000ft. 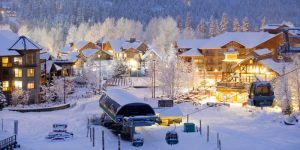 Travel in the comfort of a heated snowcat, and experience the serenity of the high alpine, inspired fondue dining, and the sparkling lights of Whistler Village. More information regarding these and other activities, available here. Ziptrek Tours Experience a high flying adventure with Ziptrek’s network of ziplines and suspension bridges. This is a must do activity when you visit Whistler; ziplining through the tree-tops of snow-covered forests. Indoor activities A few options to beat the winter weather and still keep active: yoga, rock climbing, indoor skating. Snowmobile tours Not to be missed – a unique winter activities in Whistler and enjoy the thrill of a snowmobile ride through the pristine backcountry. The Whistler snowmobile adventures range from gentle family cruising to advanced backcountry powder riding. Scandinave Spa Invigorate and cleanse your body, mind and soul. Rejuvenate at the outdoor spa, which is just minutes from Whistler Village. This Nordic-inspired well-being oasis of calm is tucked away in peaceful spruce and cedar forest on the edge of Lost Lake. Enjoy hot baths, wood burning Finnish Sauna, eucalyptus steam room and refreshing waterfalls and melt away with a relaxing massage. Soak in the calming hot water whilst you enjoy Whistler’s incredible mountain vistas; and breathe in the exhilarating mountain air. HOW LONG SHOULD WE PLAN ON STAYING AT WHISTLER? Yes, there is quite a choice of supermarkets, liquor stores, drugstores, and gourmet outlets. WHAT CLOTHING SHOULD WE PACK? Our best advice is to dress in layers, especially if your trip is in the early or late season. As with most large mountains, the base and alpine elevations are very different. What might feel like sweater weather in the village can be much colder weather on the top of the mountain, so layers are essential. Waterproof gear is highly recommended even for the days that you might not be skiing. Even if it’s snowing on the upper sections of the mountains, it might be raining at lower elevations and in the Village. Whistler is quite a laid back, casual ski town. Even for fine dining, smart-casual attire is appropriate. Sometimes you’ve just got to have some time to yourself, and we totally get that! For ages 18 months to 4 years, Whistler Blackcomb Daycare runs every day in the winter season from Whistler and Blackcomb bases, and weekends in Creekside. These are day-long programs covering the same timeframe as a ski day with licensed facilitators and plenty of fun-filled activities. Be sure to dress them warmly as they do go out to play. This is a popular program with limited space that will sell out on busy days – as always, it’s best to book early. For children outside those age ranges, we highly recommend Snow School daily or weekly lessons, perfect for parents who want to ski solo and have their kids learn fundamentals at the same time. 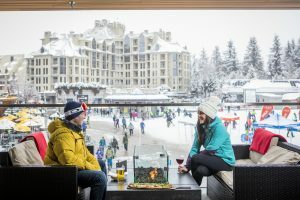 A steady stream of accolades and #1 rankings are proof of Whistler’s enduring global appeal and competitive edge, but those who’ve spent time at the all season mountain resort say that Whistler’s real staying power is in the way the place hooks you in, drawing people back year after year. For the third consecutive year, the SKI Magazine Resort Survey has named Whistler Blackcomb as the No. 1 Overall Ski Resort in North America. Whistler Blackcomb has held this title four times in the last five years and has also consistently scored high for terrain variety, off-hill activities, lodging and après. With approximately 15,000 people surveyed, the SKI Magazine Resort Survey is the most comprehensive survey of its kind.